Thanks to Alessandra from Italy for solving the Chaplin mystery. Time for another one! 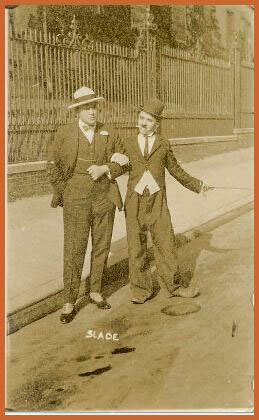 !Is the person in the Little Tramp costume below our Charlie? Several folks have looked at this one for me and have come up with no conclusive answer. I thought maybe some identification of the place or the fellow he’s linking arms with may help. I want to think the large fellow is actor and restaurateur Nat Goodwin, which would make it seem more plausible that this was Charlie. What do you all think?